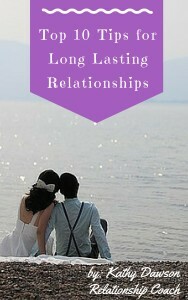 Are you looking to create a Long Lasting Relationship? It can happen, long term relationships also lead to happy lives. Download this free report and learn my top tips on making this a reality for you and also to receive other tips and information on ways to improve your relationships. You will also receive Coach Kathy's Relationship News and Updates!